Most small objects stuck in the surface skin can be removed at home. Larger, deeper, or hidden objects in the skin should be removed by a doctor right away. Pain: most tiny slivers are in the surface skin. They do not cause much pain. These include cactus spines, stinging nettles, and fiberglass fragments. Foreign bodies that stick out or are deep in the skin are most often painful. Foreign object feeling: often people have the feeling of something being in the skin, even when it cannot be seen. If a person feels like there is something there, he or she is almost always right! Most tiny foreign bodies in the skin surface can be removed at home. These include splinters, cactus spines, fiberglass, and pieces of glass. If something needs to be removed by a doctor, see one right away. Waiting may cause the object to become hidden or pushed in more deeply. The doctor can numb the skin before the object is removed. Organic slivers (wood or thorns) most often become infected if they are not removed. Nonorganic slivers (metal or glass) often do not become infected. There is no danger of lead poisoning. Pencil leads are made of graphite and clay, not lead. Sometimes the graphite dust can leave a tiny black stain in the puncture wound. You can remove most small foreign bodies from the surface skin at home. Tiny, Pain-Free Slivers: If you have many of these, they can be left in. Eventually they will work their way out with normal shedding of the skin. Your body may also reject them by forming a tiny little pimple. Check the tweezers to be certain the ends meet exactly. If they do not, bend them so that they meet. Clean the tools with rubbing alcohol or a flame before use. Clean the skin around the sliver with rubbing alcohol before trying to remove it. Be careful not to push the splinter in deeper. If you don't have rubbing alcohol, use soap and water. Do not soak the area if the object is wood. This can cause swelling of the splinter. Step 1: Use the needle to fully expose the end of the sliver. Use good lighting. A magnifying glass may help. Step 2: Grasp the end firmly with the tweezers. Pull it out at the same angle that it went in. Getting a good grip the first time is important. This is especially true with slivers that go in perpendicular to the skin or slivers that are trapped under the fingernail. It may be hard to expose a sliver if it is under your fingernail. Cut a piece of the nail away to expose the sliver. This should be done with fine scissors. Clean the scissors with rubbing alcohol before and after use. If you can see the whole sliver, remove it by pulling on the end. 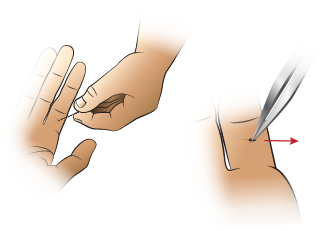 If the end breaks off, open the skin with a sterile needle along the length of the sliver. Then flick it out. Antibiotic Ointment: Put an antibiotic ointment on the area. Do this one time after the object is removed. This will reduce the risk of infection. If your last tetanus shot was more 10 years ago, you need a booster. You should try to get this shot within the next couple days. Tiny Plant Stickers: Plant stickers (stinging nettle), cactus spines, or fiberglass fragments are hard to remove. They most often break when you put pressure on them with tweezers. Tape: First try to remove the small spines or fragments with tape. Do this by touching the area lightly with very sticky tape. Warm up the wax in your microwave for 10 seconds. Spread a layer over the fragments. Cover it with the cloth strip that came in the hair remover package. Let it air dry for 5 minutes. You can speed up the drying with a hair dryer. Then peel it off with the fragments. Most fragments will be removed. The others will most often work themselves out with normal shedding of the skin. You can use all-purpose white glue, but it does not work as well as wax. If your last tetanus shot was more than 10 years ago, you need a booster.